LR News: We’re Looking for a Summer Intern! Are you a college junior or senior, graduate student, or recent college grad who loves and/or writes Asian American poetry and is interested in small press magazine publishing? Do you possesses superb organizational skills, appreciate beautiful design, and have a knack for working with social media, blogs, and other web applications? 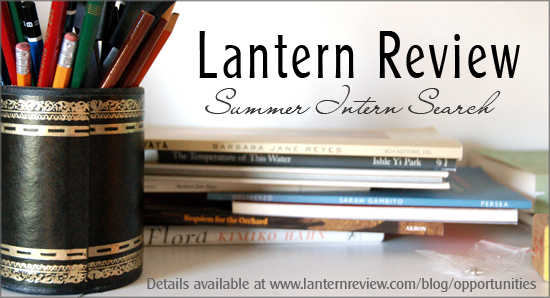 Lantern Review is searching for a part-time intern to assist us with administrative and editorial tasks this summer, and you might be just the right person.